At 6 a.m., you’ll find Neil Vader and his oldest son Gavin guiding their combine through fields of tangled vines in Prince Edward County, the big machine collecting fat pea pods and separating the green peas as it goes. By 7, the first load reaches the packing house, run by operations manager Nathan Vader and his mom Barb. Here the peas are triple-washed, packed in 400-gram bags and sent straight to the cooler to keep them fresh and sweet. Mill Creek Farm’s food safety manager Beth Vader-Kuijpers, 37, was eight when her parents began growing and packing fresh green peas. They’re now shipped throughout Ontario and east to the Maritimes. “At that time, the shelled peas arrived at the sorting table in buckets and the whole family would scoop them into bags by hand with a 2-cup measure,” Vader-Kuijpers recalls. Until the mid-1900s, the county was dotted with canning factories instead of wineries, and the Garden County provided 30 per cent of Canada’s canned fruits and vegetables. Neil Vader worked for Cobi Foods, managing field operations for crops including peas. His own family has farmed in the county since 1800. As tastes evolved, Vader decided to try his hand at selling fresh shelled peas, buying equipment left behind as the canneries closed. Today, the family harvests more than 400 acres of peas from mid-June until Thanksgiving. 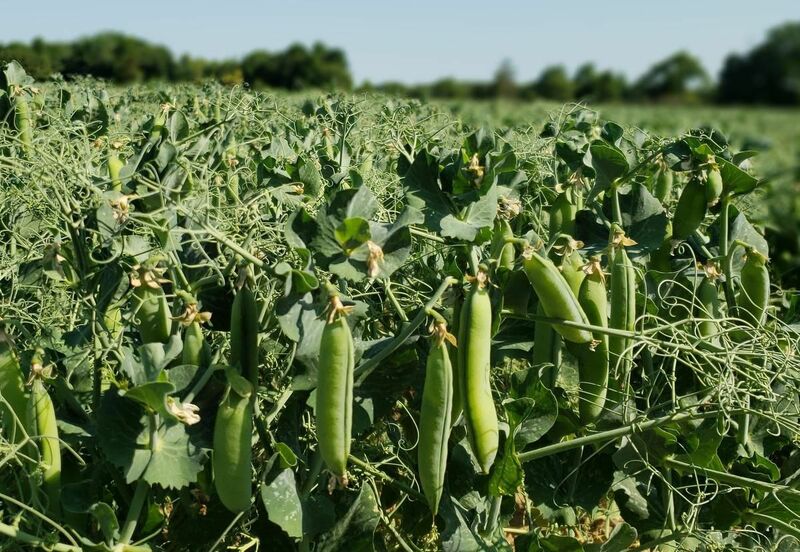 If you’ve bought green peas in the shell and found them starchy instead of sweet, you’ll understand how crucial it is to pick them young before the sugars turn to starch. “My dad and brother have been doing it for so long, they can throw a handful of peas in their mouth and know if they’re ready,” says Vader-Kuijpers. Keeping delicate peas cold also helps preserve their sweetness. As for recipes, hot buttered peas and creamed peas on toast remain Vader family favourites, and she says her own three kids happily eat peas for breakfast, lunch or dinner. Green peas are an excellent source of folacin and a source of Vitamins A, C and potassium, with 5 grams of fibre per cup. They’re also low-cal; 1/2 cup (125 mL) of cooked peas has just 70 calories. Farmer’s markets are a good source of fresh peas in the pod. Choose full, bright green pods. If you can see the pea shape through the pod or if the peas are square-looking they’re likely past their prime and starchy. Keep cold! Refrigerate, unshelled, in a perforated plastic bag up to three days. The sooner you cook them, the sweeter they’ll be. Bags of shelled Mill Creek Farm peas should be used quickly or frozen for later use. Frozen sweet “petits pois” are a great option year-round. Thaw at room temperature and cook for a minute or throw into casseroles as is. To shell pods, cut off stem end and remove strings. Open pod and run your thumb down its length to remove peas. Cooking makes peas taste sweeter and turns them bright green. Beth Vader-Kuijpers starts peas in cold water. Bring to a boil and immediately remove from heat. Drain and add butter, salt and pepper to taste. When boiled, peas may release a foam of water-soluble protein. “You know you’ve cooked them too long if you have a pot full of foam!” she says. From soups to salads, grain dishes to casseroles, peas suit any recipe. The French add fresh mint and thin-sliced lettuce to sautéed green peas. Toss hot peas with finely chopped tarragon, chives, sorrel, mint or parsley at the last minute. 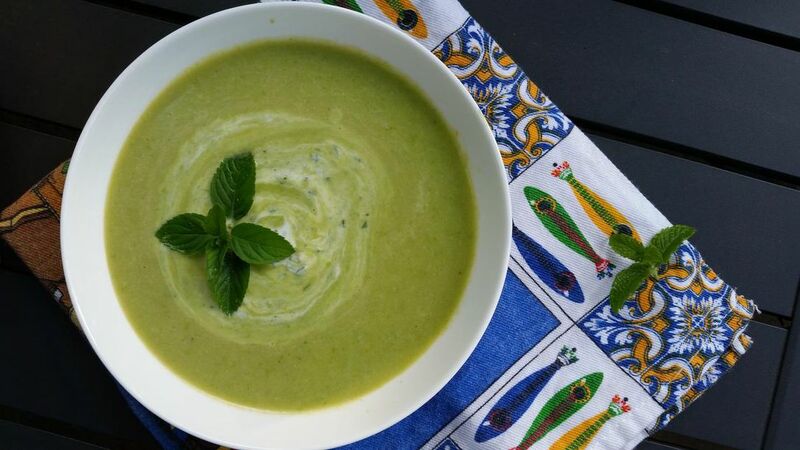 My favourite caterer Simon Kattar of à la Carte Kitchen offers this bright, minty summer soup. Melt butter in a large saucepan over medium-low heat. Add leeks and cook, stirring occasionally, 6 to 8 minutes or until tender. Stir in chicken broth and increase heat to high. Bring to a boil. Add peas and cook, stirring occasionally, 3 minutes or until tender. Remove from heat and add salt and pepper to taste. Purée pea mixture until smooth with an immersion blender or in batches in a blender or food processor. Transfer soup to a bowl and whisk in 1/2 cup (125 mL) yogurt. Adjust salt and pepper and chill 30 minutes or up to 2 days. To serve, whisk together lemon juice and remaining yogurt. Add chopped mint and swirl into each bowl. Makes 4 servings. Very nice – I love buying those shelled peas from the County.